What is the UNICODE Function? 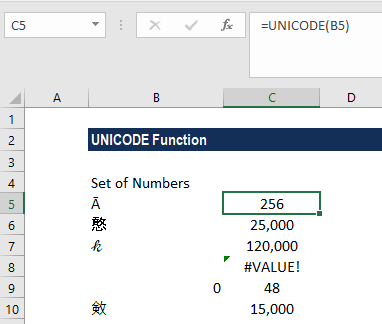 The UNICODE Function is categorized under Text functionsFunctionsList of the most important Excel functions for financial analysts. This cheat sheet covers 100s of functions that are critical to know as an Excel analyst. It will give the number ( code point) for the first character of a supplied text string. 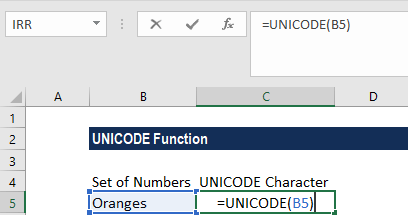 The function was introduced in MS Excel 2013. Text (required argument) – It is the character or text string for which we need the Unicode character. The text argument can be a single character that is surrounded by double quotation marks (” “) entered directly into the function or a cell reference to the location of the character in a worksheet. 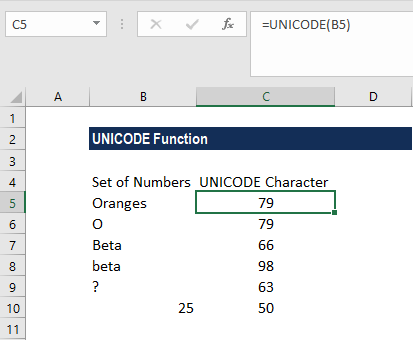 How to use the UNICODE Function in Excel? 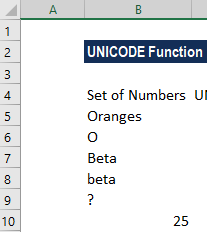 When we gave Oranges, the UNICODE function returned the code point for the character “O”. It gives the same result for UNICODE (“O”), which is 79. When we gave Beta, the UNICODE function returned the code point for the character “B” (UPPERCASE). The result is 66. When we gave beta, the UNICODE function returned the code point for the character “b” (lowercase). The result is 98. Remember that the uppercase or capital letters on the keyboard uses different character codes than the corresponding lowercase or small letters. For example, the UNICODE/ANSI code number for the uppercase “A” is 65 while for the lowercase “a”, the UNICODE/ANSI code number is 97. We got a #VALUE! error because we gave an unidentified number in row 8. Unicode numbers are partial surrogates and data types are not valid. Unicode numbers fall outside the range allowed. UNICODE is the opposite of the UNICHAR function.